When your loved ones get arrested, the first thing you should worry about is getting them out as soon as possible. Securing the release of your loved one through a Bail Bonding company is usually the easiest and fastest way possible. But before you sign the bail contract which is a legally binding agreement between you and the bail bond company. It is important you gather a few questions to ask them before you commit to anything. 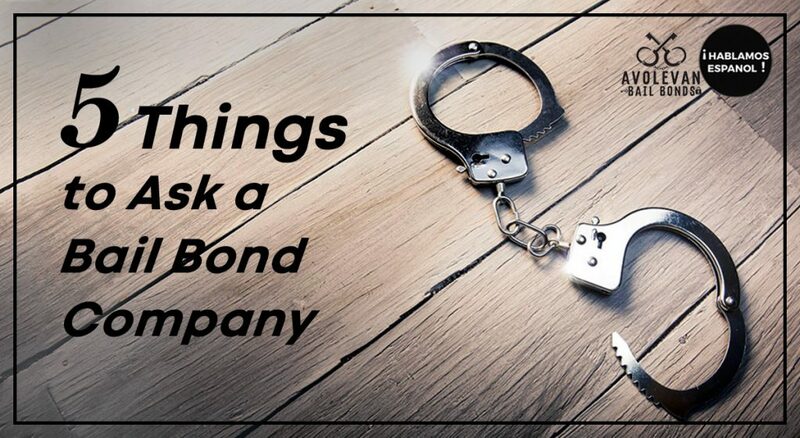 Here are a few questions to potentially ask a Bail Bond company when you are talking on the phone with them. 1. How fast can my loved one get out of jail? This is one of the most important questions you can ask because jail is not a pretty place to be. However, this question can be subjective depending on where your loved one is located in jail. The paperwork process where the co-signer(s) signs promising the appearance of the defendant and understands his or her responsibilities as a co-signer (insert link to another article). Paperwork usually takes anywhere between 30 minutes to 1 hour. Each case is different. Once the paperwork is finished and the bail can be posted, release from jail can be anywhere from 15 minutes to 5+ hours depending on where they are in jail. People who are in jail in local police departments or sheriff’s departments can see release be anywhere from 15 minutes to 1 hour. People who are in jail in county jail can see release taking the place of about 5+ hours. 2. How can I understand the Bail Bond process? If you need a bail bond for the first time in your life, calling the right company is important. Whichever bail company you call, they should be more than willing to explain to you the process and give you all your options to securing the release of your loved one. They should explain to you the responsibilities of bailing someone out. 3. Are you a licensed bail agent? Making sure you do business with a licensed bail agent is important. People who are not licensed to do bail in the state of California should not be involved in any bail bond matters. You can always ask for proof of license by the state of California. License demonstrates that the company has achieved all qualifications to conduct bail business in the state of California. 4. Are you listed with the Better Business Bureau? Like any business, bail bond companies can be listed with the Better Business Bureau as well. Its rating is based on well it conducts its business with other clients and how it operates with integrity on a daily basis. When you do business with a reputable company, you want to make sure they are in good standing with the BBB. You can always ask for credentials prior to signing any paperwork. 5. What percentage do you charge? Another important question if not the MOST important question is how much a bail bond company charges you. Sometimes the percentage of companies have to charge can be out of their control. For example, the state of California has a mandated percentage to ensures everyone’s safety and integrity. Most companies charge anywhere from 8-10% for each bail bond depending on what you qualify. This depends on certain factors, but the agent’s job is to make sure you pay the lowest rate possible. This fee is nonrefundable, and it is mandated by the state of California to make sure the companies can make money and recoup losses it may incur while bailing people out of jail. The percentage will be clearly listed on the contract you sign. Bailing someone out of jail requires you to sign a legally binding contract. Before you sign away, it is important you understand all terms and responsibilities when bailing somebody out of jail.